ReadyLIFT® Leveling and SST Lift systems not only transform trucks like the Tacoma into taller, better looking vehicle, but they also provide a more commanding view of the road. 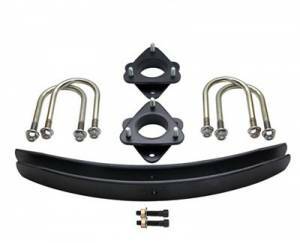 Mild kits from ReadyLift® Suspension Inc., the leader in suspension leveling systems, are the most economical and safe method of altering vehicle ride height, which also allows the consumer to upgrade his tires to a preferred larger size. Nothing looks better than a truck fit with an aggressive stance and that is exactly what ReadyLift® Smart Suspension Systems (SST) provide! An alignment will be necessary upon completion of installing the kit. Like all other ReadyLift kits, the 2005-2013 Tacoma SST Lift Kit is guaranteed for life against manufacturing defects. Popular wheel and tire sizes used for this vehicle are 16x8, (4.5" backspacing) and 31” tires (245/75R16).